Strolling through Seattle’s vibrant Capitol Hill neighborhood, you may not notice an assisted living community in your midst — let alone the 2015 Senior Housing News Design Award winner for “Best Assisted Living,” Aegis on Madison. The man behind Aegis on Madison probably wouldn’t mind. In fact, he was thrilled when a FedEx delivery man entered and swiftly turned around to leave, assuming the building couldn’t possibly be an assisted living facility. 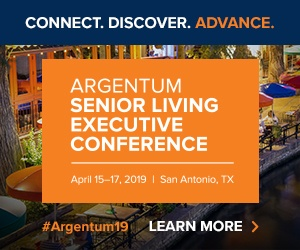 “We always want people to say: ‘This doesn’t look like anything like how I thought it would look,’” Aegis Living CEO Dwayne Clark tells Senior Housing News. From the outside, Aegis on Madison rivals some of the trendiest boutique hotels in Seattle. On the inside, it has “everything you would expect in an assisted living building,” according to John Cronin, principal at AG Architecture and a 2015 SHN Design Awards judge. It also has all of the amenities you would find in independent living, he says, in reference to the community’s sports den, movie theater, cocktail bars and open-air, rooftop sky lounge. And if you do happen to be strolling by, you can feel free to drop in: Aegis on Madison opens its shared spaces for private events and community meetings, and operates both a public coffeehouse and a mercantile boutique on-site. This integration within the greater community, paired with Aegis on Madison’s unwillingness to play down to old people or to assisted living residents, led to its victory in the “Best Assisted Living” category. Clark saw a gap in the diverse Capitol Hill market — a high-density, metropolitan area of Seattle that is at once artsy and upscale, with a variety of coffeehouses, restaurants and performance venues. There weren’t any senior living options in the area that were creative enough, he believed. There also weren’t any good options in terms of high-end, luxury senior living. Aegis on Madison, then, was envisioned as a one-of-a-kind reflection of the Capitol Hill neighborhood. Conceptualizing the actual building given the available space, however, was not without its challenges. “The site chosen for Aegis on Madison was particularly challenging because it was triangular,” Clark says. The site consists of less than an acre of property in total. For inspiration, Clark turned his sights to an architectural mainstay: Rome. While vacationing there, he noticed a building on a corner lot he thought would be perfect to emulate. He sent a picture of it to VIA, the architecture firm charged with designing Aegis on Madison. Sure enough, the design was a great fit. Right-sizing the building for the lot was only part of the story. Inside, Aegis on Madison’s design and amenities were designed so as not to “play down” to seniors or assisted living residents, notes Elisabeth Borden, principal at The Highland Group and a 2015 SHN Design Awards judge. “Instead, the design provides a handsome place to live that would be very appealing to people in their 40s and 50s who are just looking for a great place to live,” Borden says. Aegis on Madison’s secured memory care floor, which features a second-level outdoor deck, is designed to appeal to its residents as well. The deck, in an effort to bring back feelings of yesteryear, features a vintage car and a facade that is painted like the doorsteps of classic homes you’d find in the Pacific Northwest. More generally, Aegis on Madison was also designed to treat all of its residents like dignified adults, not children — to offer them cocktail bars, not ice cream parlors, as Borden points out. “This is the first time I’ve seen such a focus on dignity and respect put into an assisted living and memory care facility,” Aegis on Madison General Manager Rob Liebreich says. Construction began on Aegis on Madison in spring 2012. Aegis Living originally budgeted $33.4 million for the project, raising the capital through conventional financing methods. There was “nothing major” in terms of challenges leading up to or during construction, Clark says. Such a detailed project does cost a pretty penny, though. To begin with, urban land is expensive — more so than suburban land, which providers sometimes choose for this very reason. Then, there are the higher insurance rates that come with operating the Queen Bee Cafe on-site, Cronin notes. Aegis on Madison also went above and beyond to make sure the movie theater was in fact a movie theater — complete with a ticket booth and a marquee advertising showtimes. The movie theater’s marquee cost $100,000, the ticket booth cost $60,000 and the ticker tape showing stock prices and game scores in the sports den cost $30,000. Similarly, the project leaders wanted to make sure the sports den was an enviable “Man Cave.” The 900-square-foot space is outfitted with several leather couches, a bar with a bartender, a wall of flat-screen TVs and autographed sports memorabilia. Despite the added expense, Clark did not hesitate to include these extra details in the final design. He viewed them as essential. “That’s what separates us from the competition, that level of detail,” Clark says. Liebreich agrees, and has considered the details from a resident’s perspective. “The details make it quite a therapeutic place from the moment you walk in,” he says. Rather than focusing directly on revenue-generating design elements, Aegis took the greater community and all of its residents into consideration when it converted the top floor of Aegis on Madison into a sky lounge, rather than several “nicer,” more expensive apartments. This is a step different providers may not have taken, Liebreich says. The 100,000-square-foot building was completed on Feb. 14, 2014, only slightly over the original $33.4 million budget, at $34 million. The community, which has 75 assisted living units and 29 memory care units, was 99% occupied within 13 months. Aegis Living has “absolutely” realized its return on investment with Aegis on Madison, Clark says. Though the community has not yet been open for two years, the company has paid back 100% of its equity investors and the property is ready to be refinanced. The property has seen success in other areas, too. Its proximity to local nonprofits and charities has enabled residents to volunteer with ease, and the on-site restaurant and mercantile boutique have enjoyed patronage from Capitol Hill and Aegis residents alike. This regular interaction between Aegis on Madison and the Capitol Hill community impressed SHN Design Award judges. “When it came to integration with the greater community, at least with the local neighborhood, I think that makes a lot of sense,” Cronin says. Aegis on Madison’s exterior design, including a trendy ground-floor coffeehouse, is “a perfect fit” with the neighborhood, Borden says. An added bonus: Queen Bee Cafe, named after Dwayne Clark’s mother, donates 100% of its profits to charity. One of Liebreich’s favorite parts of Aegis on Madison’s design is the community-building it enables through its numerous shared spaces. He says the building allows residents to enjoy purposeful programming on all seven floors, and every one of the shared spaces allow for intergenerational programming. Even non-residents get in on the action: Aegis on Madison recently hosted a wedding shower in the sky lounge, for instance. “The space for residents to congregate really makes the community come alive,” Liebreich says. All things considered, Aegis on Madison may showcase the direction assisted living is headed, Cronin says. “Assisted living is getting more and more like independent living,” he explains.